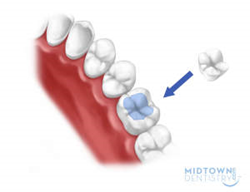 Midtown Dentistry in Houston, Texas, is pleased to announce it is now an amalgam-free dental office. All patients with cavities, or with old fillings that need replacing, will benefit from the very latest white fillings that can safely repair and restore teeth. From now on any cavities will be repaired using the very latest materials, all of which are completely amalgam free. Even though amalgam fillings have been deemed as being safe for use by the FDA for adults and children over the age of six, they do contain mercury which can release vapor. In fact an amalgam filling consists of approximately half liquid mercury while the other half consists of a combination of different metals which include copper, tin and silver. As a result greater numbers of patients are concerned about having amalgam fillings in their mouth and choose to have them replaced with amalgam free fillings. In addition, the modern mercury free materials used to repair teeth can create much more aesthetically pleasing results as they are tooth colored, and can be healthier for the overall tooth structure. While Dr. Jonathan Penchas, and other dentists at Midtown Dentistry in Houston, Texas wouldn't necessarily advocate removing amalgam fillings that are still fit for purpose, when the time comes they are able to safely remove and dispose of these fillings, and can replace them with either white tooth colored composite resin fillings, or with porcelain fillings, restoring teeth so there is little sign they have been repaired. All amalgam fillings will need replacing eventually as they do crumble and leak as they age. Apart from the aesthetic and health concerns of amalgam, the material also flexes when it comes into contact with hot and cold which can create micro fractures within the tooth, something that doesn't happen with more modern amalgam free alternatives such as porcelain or composite resin. Anyone concerned about the presence of amalgam fillings in their mouth should talk to Dr. Penchas about their removal.